Kallmann, Helmut. "Missionaries in the 17th Century". The Canadian Encyclopedia, 19 December 2016, Historica Canada. https://www.thecanadianencyclopedia.ca/en/article/missionaries-in-the-17th-century-emc. Accessed 19 April 2019. 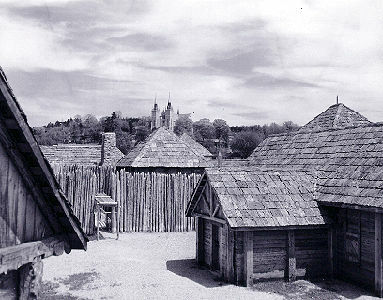 The presence of Roman Catholic priests, lay brothers, and nuns among the first settlers in New France was an important factor in the development of the colony. The prime object was to convert the Indigenous people but the missionaries also looked after the spiritual needs of the colonists. 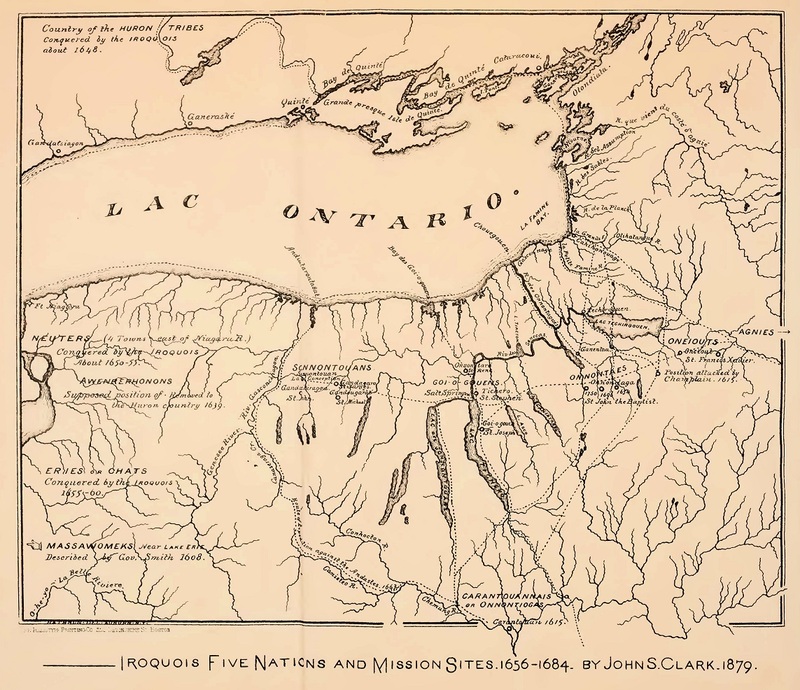 Map published in the 1879 book by John S. Clark, Early Chapters of Cayuga History: Jesuit Missions In Goi-O-Gouen, 1656-1684. The first missionaries, who arrived in Québec City in 1615, belonged to the Récollet order. They were reinforced by Jesuits in 1625, and after the brief period of British rule 1629-32 (during which most of the priests returned to France), the Jesuits became the leading order. Their work was supported in Québec by the Ursuline nuns, who were active mainly as teachers and nurses after 1640. In Montréal the Sulpician fathers were established in 1657. Although Jacques Cartier had observed musical activity among the Indigenous people, and Marc Lescarbot had notated the pitches of some songs of the Souriquois (Mi'kmaq) at Port-Royal (Nova Scotia) in the first decade of the 17th century, it was the Récollet historian Father Gabriel Sagard-Théodat (fl 1614-36) who first devoted an entire chapter to music and dance: "Des danses, chansons et autres cérémonies ridicules de nos Hurons" in his Histoire du Canada (Paris 1636, new ed, Paris 1866). For the first time, Canadian Indigenous music appeared in notation, but, as Amtmann (Music in Canada) has pointed out, the music is based on Lescarbot's earlier examples and is not Huron music, but Souriquois and Brazilian Indigenous in origin and European in arrangement. 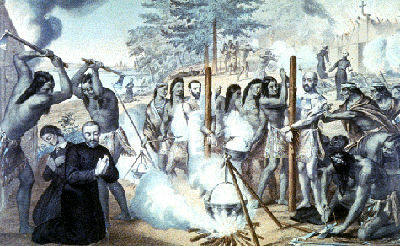 It remained to Father Jacques Marquette and Louis Jolliet, on their journey of 1673, to notate, for the first time in reasonably accurate form, an Indigenous song — the first, at least, to have survived, in Bacqueville de la Potherie's Histoire de l'Amérique Septentrionale (Paris 1722). Typical impressions of Indigenous music are to be found in the diary entries of Father Paul Le Jeune (1591-1664) who served 1632-9 as superior of the Canadian missions. In 1632 he relates that the Haudenosaunee (Iroquois) "began to sing, in order to show that they were not at all afraid of death, however cruel it might be. Their singing seemed to me very disagreeable; the cadence always ended with reiterated aspirations, 'oh!oh!oh!ah!ah!ah!hem!hem!hem!' etc. After singing for some time, they were made to dance, one after the other" (JR, vol 5, p 27; 1632-3). In 1634 Le Jeune provided a description of the use of music in the healing of the sick: "They make use of these songs, of this drum, and of this noise or uproar, in their sicknesses... I have seen so much foolishness, nonsense, absurdity, noise, and din made by this wretched sorcerer in order to cure himself, that I should become weary in writing and would tire your reverence, if I should try to make you read the tenth part of what has often wearied me almost beyond endurance. Occasionally this man would enter as if in a fury, singing, crying and howling, making his drum rattle with all his might; while the others howled as loudly as he, and made a horrible din with their sticks, striking upon whatever was before them; they made the little children dance, then the girls, then the women; he lowered his head and blew upon his drum, then blew toward the fire; he hissed like a serpent, drew his drum under his chin, shaking and turning it about; he struck the ground with it with all his might, then turned it upon his stomach; he closed his mouth with the back of one hand, and then with the other; you would have said that he wanted to break the drum to pieces, he struck it so hard upon the ground; he shook it, he turned it from one side to the other, and, running around the fire several times, he went out of the cabin, continuing to howl and bellow; he struck a thousand attitudes, and all this was done to cure himself. This is the way they treat their sick" (JR, vol 6, p 187, 189). A third quotation from Father Le Jeune is in the form of a generalization: "The Savages are great singers; they sing, as do most of the nations of the earth, for recreation and for devotion, which, with them, means superstition. The tunes which they sing for pleasure are usually grave and heavy. It seems to me that occasionally they sing something gay, especially the girls, but for the most part, their songs are heavy, so to speak, sombre and unpleasant; they do not know what it is to combine chords to compose a sweet harmony. They use few words in singing, varying the tones, and not the words... They say that we imitate the warbling of birds in our tunes, which they do not disapprove, as they nearly all take pleasure both in singing and in hearing others sing; and although I told them that I did not understand anything about it, they often invited me to sing some song or prayer" (JR, vol 6, p 183, 185; 1634). Possibly the earliest account of the successful use of music in the conversion of Indigenous people comes from the lay priest Jessé Fléché and antedates the arrival of the Récollets and Jesuits. At Port-Royal, where he had arrived in 1610, Fléché taught the Micmacs the simpler parts of the church service. Within a year he was able to baptize the chief Membertou and his tribe. At the ensuing ceremony the converts joined in the singing of the Te Deum (JR, vol 2, p 137). About 1623 Father Gabriel Sagard-Théodat embarked on a canoe voyage up the Ottawa River to visit the Hurons. His report includes the following passage: "One must also train oneself to good humour and present a cheerful appearance of modest satisfaction, and sing hymns and sometimes spiritual songs, both for one's own comfort and relief from toil and for the edification of the savages, who take peculiar delight in hearing sung the praises of God rather than profane ditties, to which I have sometimes seen them show impugnance. O Jesus, who condemnest evil Christians, singers of dissolute and worldly songs!" (Histoire du Canada, transl H.H. Langston, manuscript p 146-7, University of Toronto Library). The superior of the missions in New France, Father Paul Le Jeune, repeatedly praised the Indigenous people for accepting the music of the church: "We finish with a Pater noster that I have composed, almost in rhyme, in their language, which I have them sing... It is a pleasure to hear them sing in the words that they have learned. The women sing also, and come occasionally to listen at the window of my class room" (JR, vol 5, p 189; 1633). "The Nuns sang the Exaudiat, to the delight of our Savages; and it gave our French great joy to hear two Choirs of Virgins praising the Greatness of God in this new world' (JR, vol 15, p 229; 1639). 'We have two kinds of Christians in these countries: some have been baptized when very ill, after rather slight instruction but sufficient to allow of their receiving that Sacrament in that condition; the others have been baptized in full health, after having been well instructed in the principal and most necessary articles of our creed. Altogether, they number four hundred and fifty or thereabout, including the Hurons, who constitute by far the majority... it is a blessing deeply felt to see them attending prayers and the instructions that we give them; present at Mass on Festivals and Sundays, and some on working days; coming to Vespers when they are sung in our Chapel at Sillery, chanting the Pater and the Credo, the Commandments of God and some Hymns composed in their Language" (JR, vol 16, p 59, 61; 1639). "[Mme de La Peltrie] often visits them [the "Savages"] at other seasons, and takes with her some Indigenous girls from the Ursuline seminary, who have learned to sing very sweetly, both in their own language and in French" (Preface to JR, vol 18, p 5; 1640). The Jesuit priest François-Joseph Le Mercier (1604-90) expressed his satisfaction with the singing of the converted Hurons: "The beauty of their voices is exceptionally rare, especially those of the girls, for whom there have been composed, and adapted to the airs of the Church hymns, some canticles in Huron language, which they sing in a charming manner. It is a holy consolation, far from being barbaric, to hear the fields and forests resound so melodiously with the praises of God, in the midst of a country which not long ago one called barbaric" (JR, vol 41, p 141; 1653-4; Amtmann transl). In 1670 Father Louis André (1631-1715) reported from a missionary post on Manitoulin Island (Lake Huron) that he had written some spiritual canticles: "No sooner had I begun to have these sung in the Chapel, accompanied by a sweet-toned flute... than they all came in crowds, both adults and children; so that, to avoid confusion, I let only the girls enter the Chapel, while the others remained without, and thus we sang in two choruses, those without responding to those within" (JR, vol 55, p 147; 1670). Two years later a report from the mission of Notre-Dame de Foye, near Québec, confirms once again the success of music as a handmaid of missionary work: "The example of the French pupils — who every night, on leaving school, go to sing at benediction in the chapel of Notre-Dame de Foye — has had the good effect that the little savages, in order to imitate them, have learned to sing beautiful hymns in their own language; and they sing them even in their houses, in the streets, in the fields, and wherever they happen to be. Thus these little creatures, ignoring all the profane songs of their ancestors, have on their lips only the spiritual motets that the Father teaches them. The result is, that in a short time they learn with pleasure the mysteries of our faith, and all their prayers, which they are made to sing to various airs, changing the words and the music as is done in the church, on the return of the yearly festivals" (JR, vol 57, p 61, 63; 1672 or 1673). In 1676 Father Jean Enjalran reported about the Indigenous people from the Huron seminary west of Québec: "One is charmed to hear the various choirs, which the men and women form in order to sing during mass and at vespers. The nuns of France do not sing more agreeably than some savage women here; and, as a class, all the savages have much aptitude and inclination for singing the hymns of the church, which have been rendered into their language" (JR, vol 60, p 145; 1676). The Jesuit Relations and other 17th-century documents contain many references to the priests' chanting of the Te Deum, the Salve Regina, or the Stabat Mater and their celebrating the Mass. Among these men was Jean Le Sueur (also known as Abbé Saint-Sauveur, ca 1598-1668) who had arrived in Québec in 1634 and was the first secular priest on the shores of the St Lawrence. As he had "a beautiful baritone voice and a perfect acquaintance with plainsong he offered his services to help with the town ceremonies; this, one invited him frequently to do" (J.B.A. Allaire, Dictionnaire biographique du clergé canadien-francais, vol 6, Montréal 1934). To quote some contemporary evidence: "Monsieur de St. Sauveur excellently sustained the music. At the temporary altars we tried to have two boys sing some clauses of the litany of the name of Jesus — 5 or 6; but Monsieur the prior had to aid them" (JR, vol 28, p 197; 1645 or 1646). Another capable singer was Father Jean de Quen (1603-59), the founder of the Saguenay missions and a teacher at Québec, Sillery, and Tadoussac. The first Indigenous-born Canadians to be ordained as priests, Germain Morin and Charles-Amador Martin, participated in the church service as musicians. René Chartier (in Canada 1643-7) and Claude Dablon (1618 or 1619-1697) are two other priests whose chanting is documented in the Jesuit Relations. 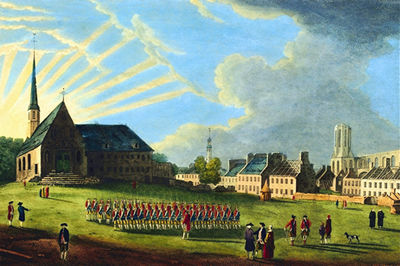 Other priests occupied the office of grand chantre in Québec, supervising the ceremonial and musical aspects of divine service. It is difficult to identify with certainty those priests who composed music since the word "composed," as it is found in contemporary records, may apply also to selecting the music (ie, to composing the programs of music to be used). The priests who may be considered in this context include René Ménard (1605-61), Charles-Amador Martin, Louis André (1631-1715), and Jean de Brébeuf (1593-1649), who has been associated by tradition with the origin of the Huron carol "Jesous Ahatonhia". See also Ethnomusicology; Plainsong or plainchant; Roman Catholic church music; Saguenay-Lac-St-Jean; Theory textbooks.